Having been a collector of antique bottles since the 1970’s, I have watched as the hobby has gone from a national past time to a whimper and back again. Like any hobby that involves assembling various objects for display or simply for the astute collector to sit and admire, the collecting of antique bottles (mainly bottles made in America from 1840 to 1900) has been a most rewarding one for me. Before we go too far, you may be asking what and why old bottles? Well, that’s a good question and the answer is as complex as it is a simple one. 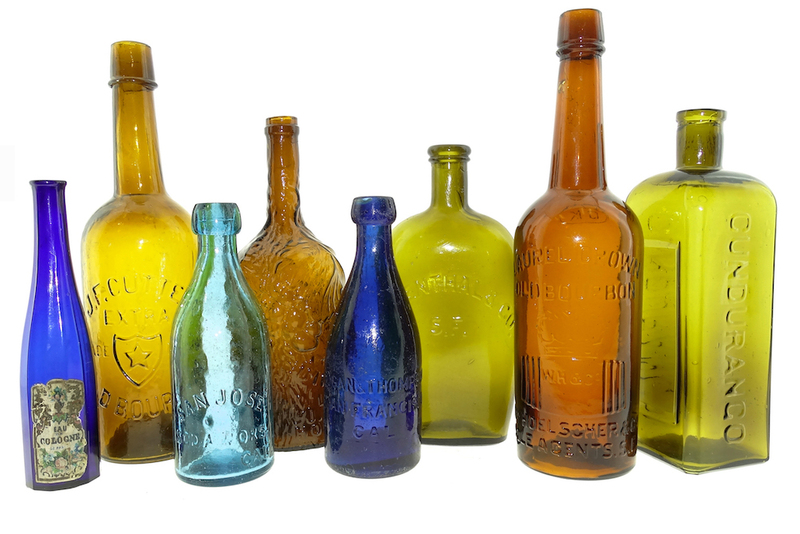 Antique bottles have an inherent beauty and history that few other collectibles can match. Not convinced? Well first off, you can display bottles unlike coins, stamps or baseball cards. They beautify your home. They teach you history. Bottles are divided into east and west coasts. Since the east was more populated the bottles they made are more diverse and, well fancy. Collectors usually collect from the part of the country they live in. Some, like me, collect anything that attracts them. Collectors go for form, type or category like medicine or whiskey bottles. Most collectors stick with one category, inkwells, sodas, etc. Most bottles come in one color like amber or aqua, when a blue one pops up the price can escalate quickly. They can also come in a combination color shade like greenish amber. That adds value. The three most important factors are color, condition and rarity. Rarity can be in both the bottle itself e.g. how many are known, and by having a rare color. Age is also a factor, but it doesn’t mean it’s more valuable. Rarity, although very important with some bottles, doesn’t mean nearly as much for others. Bottom line is collectors are looking for the best looking, rarest and best condition bottle as possible, in the category they collect. As a teenager I lived in Aptos at the center of the Monterey Bay between Monterey and Santa Cruz. We had the best of both worlds with the bay and the Santa Cruz Mountains within walking distance. My friends and I would venture up the “old mill, “searching for spots we thought may have bottles. Today this is strictly forbidden as it is a national park and even now the thought of going up and taking something gives me goose bumps. So as I got older and went to college, I still occasionally thought about old bottles. Back then it was a hobby where if a person used their heads they could find them on their own. Unlike stamps or rare coins where you have to go to shows and search others inventory or attend auctions, finding bottles was basically free for the taking for savvy searchers. It was harmless fun and people from all over the country scoured the earth for bottles. In the eastern United States collectors had more bottles to choose from and a diversity we never dreamed of out west. Although the first bottle clubs had begun in the west, the eastern folks had taken bottle collecting to a new level. As a young man I was not privy to such salient tastes but preferred western made bottles anyway. I could get them by digging them or going to antique malls. My original collection was long gone by the time I finished college and began working for a living. I had a few dollars in my pocket and now thought about bottles in a new way, where did people get antique bottles I wondered? I soon thereafter saw an ad in the local paper for a bottle show in Auburn, CA and I went. To my astonishment I met one of my old time friends from my teens there who happened to have some whiskeys for sale. He viewed our meeting as a sign from somewhere and we put together a deal that yielded me a great many nice old whiskey bottles and him some cash. I didn’t know it at the time but everyone at the show was trying to get him to sell his whiskeys to them. Being a newcomer I had no idea I was now the center of attention and I went home with my new collection and beamed ear to ear. I was once again hooked on old bottles. thousands of dollars. I had swindled this old friend and I didn’t even know it. Apparently he wasn’t aware of the “new” prices either and the deal was made with friendship and personal history in mind and while I thought I was being fair just as he was I was in fact buying for pennies on the dollar. We rectified things down the road. I soon thereafter created Pacific Glass Auctions at first and changed the name to American Bottle Auctions as we went more and more on a national level. I wrote a book, joined in the national bottle fray and enjoyed almost every minute of it. It’s been over 20 years now and we’ve sold some of the greatest bottles I never knew existed. I look at the hobby now and see how much it has changed. I remember sitting in my room wondering if I would ever get more bottles and realized I had in a way created a monster. In the beginning we had just our common embossed whiskey bottles or an occasional embossed fruit jar and it made us happy. Now I was auctioning bottles in the many thousands of dollars and it felt a lot different. The people in the hobby, well of course they’ve changed. Bottle collecting used to be an innocent hobby, of course you had your sharks typical of any hobby but when bottles started becoming valuable you saw a different group of characters entering into it. In the 70’s it was reported that bottle collecting was the second most popular hobby in the country. It had everything. You could search for bottles with family and friends, you studied history, found old garbage and you did it without the notion of value preceding each conquest. What has changed most over the last 40 years is the collector base, the way bottles are sold and the prices. In the 70’s bottles didn’t have a clear definition. In other words, today we know that there are three known of a certain bottle, and we even know what color they are and even who owns them. Back then we had no idea because they hadn’t been found yet. Most of what is to be found has been now and only the real die-hards find something fresh occasionally. In a way that’s good, but finding your own treasure in a vacant lot is all but gone. In addition the outlet for buying bottles has grown enormously. 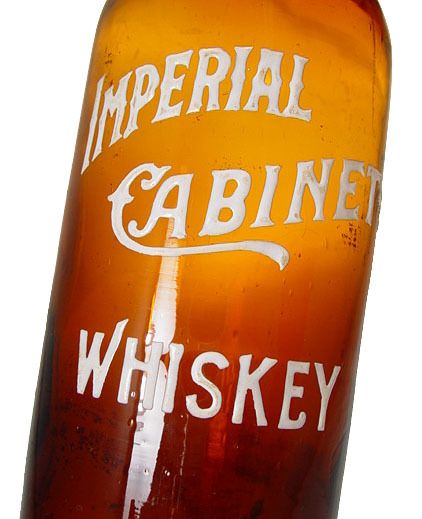 Going online you’ll see hundreds of different antique bottle sites. Auctions like ours and for sale sites, very specialized areas of collecting and numerous educational websites have also been created. The number of books that have been written is tenfold. So the learning curve of collecting has grown by leaps and bounds and that’s a great thing. The hobby has become educated. The collectors are more knowledgeable today. And let’s face it, computers changed the way we do everything and antique bottles are a good example of that. deal and even aired on CNN but today bottles sell for that on a semi-regular basis. Of course I’m talking about very special bottles with very special pedigree. Generally most of the $10 bottles from the 70’s are still in that price range, some more, some less. As mentioned earlier, bottles have different categories and they include bitters, whiskeys, historical flasks, inkwells, fruit jars, sodas, medicines and some other sub-categories. Each of these categories fluctuates in their own right. For instance bitters and historical flasks never seem to skip a beat. Sodas are a whole other ballgame. From year to year they change in demand as do western whiskeys for instance. Some categories that went down as collectors from a certain era either lost interest or exited the hobby. But generally you’ve done well holding onto your glass treasures and a lot of it depends on what kind of collector you were from the beginning. Some collectors, many in fact, just enjoyed the idea of owning an old bottle. They weren’t picky and a chip or two didn’t hurt. Today condition is everything. Back then you might trade what today is a $200 bottle for a $20 bottle because you liked it more. Today collectors can refer to numerous books and internet sites to find out values. Condition is everything in bottles today unlike years ago. A $50,000 bitters bottle can drop by half or more with a chip out of the lip. Plantation Bitters in an auction last year for $37,000. It was one of a half-dozen known. We also sold a Kelly’s Log Cabin Bitters for over $45,000 in an earlier auction, one of two we’ve sold in the same price range and in very rare colors. We sold a clear Brown’s Indian Herb Bitters for almost $30,000, an aqua Wonser’s Indian Root Bitter for $31,000 and $26,000 for the same bottle in yellow. A Harvey’s Prairie Bitters brought $21,000. A gallon sized cobalt blue Columbian Master Ink, the only non-bitters, realized $31,000 in a sale, a bargain as an earlier auction realized $50,000. These are just a handful of wonderful bottles we’ve sold in the last half-dozen years or so. We sold one collection at auction for a million and a half dollars. This list goes on and we haven’t even talked about prices on some of the top historical flasks and other categories of rare bottles. Not to mention pieces that are currently in collections and aren’t for sale. A successful sale for us is 150-200 bottles totaling $250,000. But great bottles can be had for less than $100 dollars today. Much of what buyers are paying for is rarity and color on the high dollar pieces. The bottles mentioned selling are an exception and certainly not the norm. The clear Indian Herb Bitters we sold for nearly $30,000 can be had in amber for around a grand today. 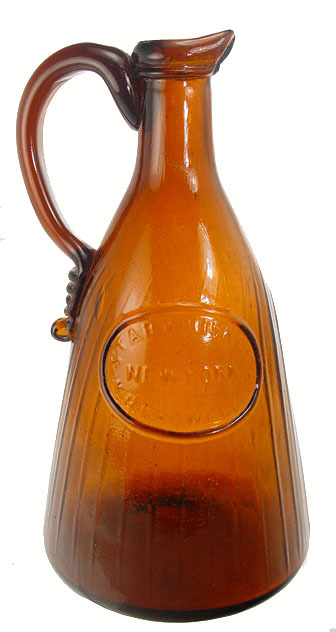 An amber Kelly’s Cabin Bitters in its usual amber sells for around $2,000, not ten times that. Not to mention there are thousands of terrific bottles to be had in the $20 range. As time goes by everything fluctuates. Every collectible has its day. For bottles it might be now–or is it? Who’s to say that a green Kelly’s Bitters at $45,000 is a lot when a very average Monet painting can bring millions? Coins, stamps, baseball memorabilia, they all tug at the heart strings of the past and for the collector of the rarest of the rare, money is no object. Thanks again for the article; I enjoyed it. Sean. Jeff what a great story of your early interest in the hobby that we love ,There has certainly been an extreme growth and new money in the search and aqquisition of these treasures and .you have certainly contributed in the growth of the hobby and have made it easier for someone in the south or Midwest to buy something from the west or anywhere through your business. Thank you for your commitment and dedication to the Federation which represents the hobby. I only wish I knew what I know now back in the 1970″s. Thats when I did a little bottle collecting. I would have bought one bottle worth a Hundred not 25 worth $4 ea. And if I searched digging places I might have not left the hobby for the 25years that I did. Oh well that was then and this is now and I love this hobby. Tremendous article …….informative and interesting! Thank you! Fantastic article !! I find that the articles that I enjoy the most are ALWAYS articles which feature, or at least incorporate, a collector’s beginnings in a hobby. I greatly enjoyed the article in Bottles and Extras that was on Bob Ferraro’s “collecting beginnings” also. I think that this type of article appeals to EVERYONE !!. I think that EVERYONE is curious as to how others got started! Every hobby newspaper or magazine, NO MATTER WHAT THE HOBBY IS, should have a permanent column, one that is in every issue, that is entitled: “WHAT I COLLECT AND WHY” . I believe that this is the name that is used in “Paper Money”, the official publication of the SPMC: The Society Of Paper Money Collectors. Thanks again for a “great read” !! Andy. (Andrew Loulis). Jeff: Nice article. I think you hit the nail on the head! 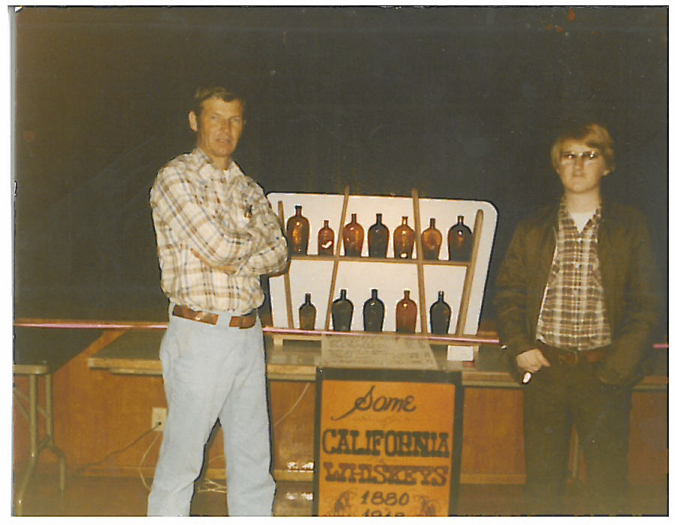 I have gone from digging bottles in northern California mine sites with my folks in the 1960′s to buying a few $20-$30 bottles to round out my dug bottles in the 1970′s to buying my first $100 bottle in 1985. Since then I have gone through collecting poison bottles, bitters, historical flasks, western bottles, sodas and barber bottles. Many of these categories have relatively few examples from digging in western states, and trading or buying is the reality of adding bottles to a collection. In some instances, the price of the hobby simply outpaced my ability to pay for them. I have found myself selling rare and dear glass because the opportunity to add to the collection is exhausted by the ongoing “sellers market” in the bottle hobby. Personally, I have decided to change MY hobby. Prestige and/or attention at bottle shows, success in bottle auctions, ownership for pride and acclaim is not why I fell in love with old glass. I fell for old bottles because they had character, they had beauty, they had history, they had a life span longer than my own. My only regret is that I wasted so much time chasing the wrong parts of the hobby while minimizing its most beautiful asset: it’s accessibility to anyone interested in old glass. uddy by chance while digging on his property he uncovered an old dump, he and I dug it and he found an amber Lighting. my job to find the dumps. I got the maps to the counties near us and highlited each and every wood line after I searched. As ther were few diggers then it was a gold mine. When I dug a broken queen I sold my collection and when to bitters after years of buyig bitters I met a guy at the great Mansfield show while showing me a 1763 sealed black glass he bumped it and chacked it he was almost in tears and said if I wanted it it would cost me $60 which I did and so much for bitters. As you know black glass can be costly so when everything I wanted started to cost over three grand I sold out and now collect Nailsea type bottles. I also with my buddy started a club and a bottle show in Paineville Ohio, all gone now. Your story touched me and I miss the innocent days when we stared. Wow Bob, what a story. We sure hope you have not lost your love for bottles. It is people like you who have made the hobby what it is today. Amen to that. I got hooked on antique bottles at the ripe old age of 15 in 1965 when I found a clear unembossed square medicine in a field next to our home. I still have a quart pottery Stone Mason fruit jar I found under a shed on the property. It truly has evolved over the years into the high class hobby it has become. I miss the days when you could head to places still largely untouched and have a good chance of coming home with a box full of bottles. Construction sites, old dumps, ghost towns, vacant lots, and derelict buildings and other places you could poke around in and likely come away with something. I too wish I still had some of the better pieces I used to own. I agree that it is becoming more of a finite hobby in that most of what was to be found has been found. I believe that you are taking real chances now if you venture into a ghost town because of the way they are policing and enforcing the antiquities laws. As for eastern and western bottles, there are a lot of very fine eastern bottles of all types, but the bottles made by the west coast bottle factories with the colors, crudity, flamboyant names and claims, and quality of the glass are in a class all by themselves. Happy collecting! Al, you are why the hobby is where it is today! Keep collecting and keep sharing your love for bottles. bottle. They are the prettiest bottles I ever dug. The blue soda is pontiled the Star Spring is not. with a possable clay pontil. Those were English, imported by Dyott before he started his foundry. Those do sound very nice, Charles! Jeff,your articles are always an interesting read. Thanks for all you do for the hobby. Thank you, Bill, for your support! I recently found a light blue KOLAFRA SPLITS Bottle, embossed with name and the PYRAMID Logo. It contained a “cola drink” made by Johnson & Johnson (pharmaceutical corp.) for two years in the mid 1890′s. I have searched far and wide and I have not been able to find another one like it. For all I know, it could be the only one of it’s kind. I’m not really a serious collector, but I know something special when I see it, but would not mind parting with it under the right cirumstances. If you are interested, I could email you a photo. You can send any appraisal requests to appraisals@americanbottle.com. As a beginner I know collecting is more than just finding a old bottle. How does one go about learning about bottles? Is there any reading source? Friends are the heart and soul of the hobby, I’ve met half the people I know through the bottle world. Like any hobby it brings people together and often times turns into a lasting friendship. You can’t beat that, thanks for the note. Jeff, I don’t know if you remember me. We went to Aptos High together and your story brought a lot of memories back- digging in Nicene, Davenport, La Selva Beach. Looking for nice bottles at the Aptos antique barn. Glad you are doing so well and preserving a hobby that was a lot of fun for me back in the day. I do remember you Glenn, I saw you at a reunion probably 10-15 years ago? We spent a year at Watsonville High. That was the beginning of my relationship with bottles. I hope you are doing well, I remember buying lunch at the Jack In The Box drive through with you without a car. Flipping for quarters during lunch. Fun times. I haven’t been back to Aptos High for some time. I guess it’s doing quite well without us. Hi Jeff, great article on bottle collecting. Like you I am a general collector and like a little of everything. Living in upstate New York gives me the chance to still find great early pieces. Anything from yard sales to digging. Auctions and ebay have changed the hobby. However you can still find them buying being persistent .I like all bottles whether it is a 20.00 or 500.00 bottle. I collect what I like. I have been collecting since the 1970′s. Anyway again great article Jeff. the lumber mill that was over the creek where they milled the old growth giants and let the saw dust drain out in it. It’s actually right at headwater of Laurel creek and Burns creek on redwood lodge road which turns into Laurel curve back to 17 highway. There has recently been a lot of big mudslides from two years ago and my boss and I are tasked with pulling the giant 2 maybe 3 rd growth redwood down the hills . I’m the choke setter / cable setter. Gnarly work for sure. Anyways ! I’m always spotting all the bottles’ when the redwood pull down and create a huge dugout pathway. And yesterday I found a bottle that is hand / mouth blown with air bubbles in the glass and it appears to like a bottle in a bottle . It’s green and 14 “ long and heavy . Excellent condition. It has a 5 pointed star on the neck up top surrounded by a very imperfect circle and there are no seams and an upside down cup/ top shaped hump going up into the bottom of it. There and. No seems at all and the star is the only marking on it . It seems to rainbow/ Tiffany hued green glass and I tried to research it but could not find very much info on what , or where it belongs from. Thinking it’s a one of kind mid 1800’s whiskey bottle or wine if they had that back then. It’s very beautiful. This site I’m on has bottles everywhere popping up outta the ground . I believe he reason is because of the loggers and the town of Laurel back in the late 1800’s that were there. . I was wondering if you could help me figure out exactly what I’ve found here. I can send pictures if you would like to see . Kevin from Rio Del Mar born and raised and graduated from Aptos high school class of 2000. We are still here, please email a picture to our email address at appraisals@americanbottle.com Thank you!